Light and soft, it yields to the touch like a bundle of wool or feathers. A blank ovoid, it could be a fencing mask. Close-up, you see striations of grey-brown, green and ash-white, thickly bandaged together. A gingery baby woodlouse emerges and tickles across the surface. It’s one of many small creatures drawing sustenance from this rotting structure. I avoided the old piggery last summer because common wasps (Vespula vulgaris) had built a nest there. It hung from a rafter like a dim, somewhat sinister paper lampshade. On hot days it made a rasping, whirring noise as if it was going to take off. 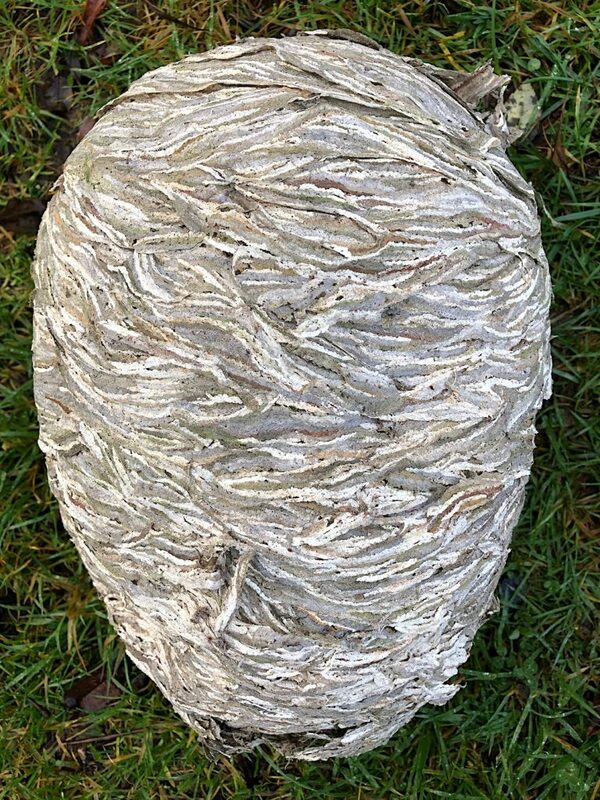 Wasps like heat; the temperature inside a nest is 5-10°C warmer than outside. But when the mercury rises too high, they fan their wings to cool things down, making a distinctive sound. The nest was still active in early November. And then I forgot about it. Last week, searching for a bucket, I found the nest fallen on the floor. It smelled deeply of fungus and forest mulch. The wasps were long gone. I took it outside and gently tore open the outer husk. Inside there was a layered pagoda of hexagonal cells, suspended on a central stem, the petiole. The crevices were sprinkled with minute white grains, fruiting bodies of micro-fungi. A mass of fine, sticky silk glistened between the layers, suspending a tiny, translucent amber spider. 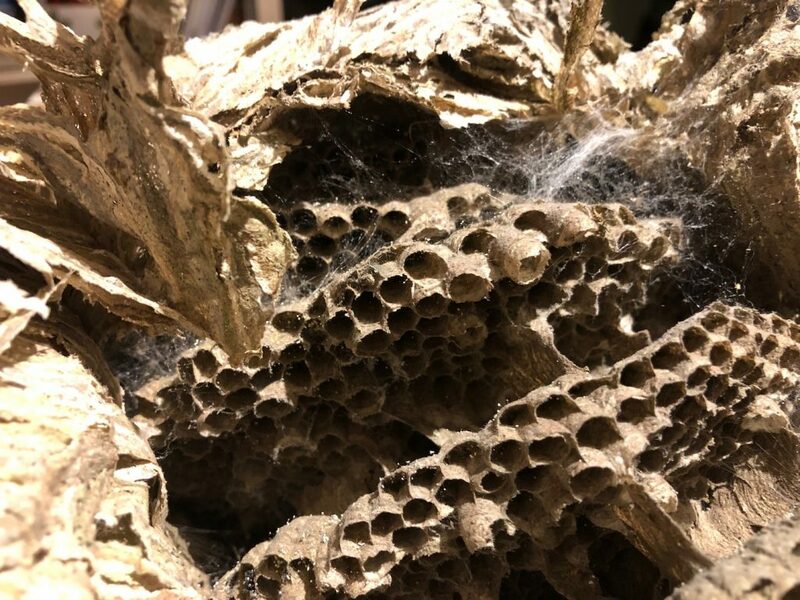 Wasps make nests from chewed wood pulp mixed with saliva. The queen begins the job in April when she starts the nest on her own and rears her first brood of workers. The workers gradually take over foraging and nest building and the queen concentrates on egg laying. Colonies grow rapidly – averaging 3,000 adults. This one was slightly bigger than average, judging from the nest dimensions: 30cm from base to tip and 22cm at the widest part. In autumn, colonies raise new queens, plus males to fertilise them. Males and workers die in early winter when their food supply fails. The mated queens hibernate, indoors if they can, waiting to start the cycle again. In three months’ time we shall be finding them all over the house, sharp sparks of spring. This was a Country Diary piece, published in the Guardian on 2 February.